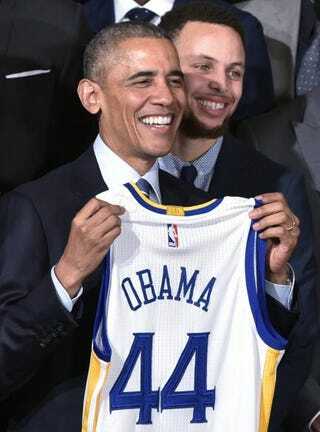 President Barack Obama and Golden State Warriors guard Stephen Curry pose during an event honoring the 2015 NBA championship team at the White House on Feb. 4, 2015. Time magazine's annual Time 100 list has some heavy hitters once again. From President Barack Obama to actress Taraji P. Henson, the list highlights the achievements of people in categories such as titans, artists, leaders and icons. Not only are the people highlighted being honored, but the articles about them are written by influential people as well. Lin-Manuel Miranda (actor-musician)—written by J.J. Abrams, writer-producer-director: "His wit would be intimidating if not for his natural and infectious charm. Somehow he is as generous, collaborative and lovable as he is innovative and brilliant." Ibtihaj Muhammad (fencer)—written by Rep. Keith Ellison (D-Minn.), the first Muslim elected to Congress: "This summer, she will represent the U.S. at the Olympic Games in Rio de Janeiro. And when she competes for her country, representing all of us, she will be the first American Olympian to do so while wearing the hijab. Ibtihaj embraced what made her stand out, and she's an Olympian because of it." Mussie Zerai (activist)—written by Ai Weiwei, an artist and activist who has been working on projects related to the refugee crisis: "For over a decade, this Catholic priest has been a lifeline for thousands of Europe-bound boat migrants in distress, relaying their locations to the Italian coast guard and navy." Stephen Curry (basketball player)—written by Misty Copeland, ballet dancer: "My definition of a role model is someone who maximizes their potential to push the boundaries of their circumstances with passion, purpose, integrity and the sensitivity to know they are setting an example for others along the way. Stephen Curry is a true role model. I can relate to his underdog story. He is showing us all how through belief in yourself, hard work and dedication, it is possible to achieve your dreams, prove your doubters wrong and go from an underdog to a Warrior." Dwayne Johnson (actor)—written by Peter Berg, director: "Unlike other action heroes, Dwayne is willing to laugh at himself, and that's made him one of the most vital pieces of the blockbuster Fast & Furious movies—among too many others to count. He has proved to be that rare combination of likable, creative and talented—but he's also a solid businessman." Ta-Nehisi Coates (author)—written by Bryan Stevenson, founder Equal Justice Initiative: "He navigates the complexities and burdens of race in America compassed by a father's love for his son. But it's the soulful writing that makes the work a classic, prompting Toni Morrison to herald Coates as America's new James Baldwin and the MacArthur Foundation to announce his genius." Idris Elba (actor)—written by David Simon, creator of The Wire: Simon wrote about the time he told Elba his character was getting killed off: " 'Brother, you're never going to lack for work again. You're going straight to features. Don't you realize that?' Long pause, deep sigh and then: 'From your mouth to God's ear,' Elba said. 'No, my naive friend, He had precious little to do with it.' "
Ryan Coogler (director-writer-producer)—written by Ta-Nehisi Coates, author: "All the beauty the Academy cannot see is in this one scene. That beauty, so often denied, is the stuff of Coogler's work. This is not a matter of looking pretty—though that is part of it—so much as a matter of looking human. That is why Ryan Coogler is so necessary right now." Taraji P. Henson (actress)—written by Lee Daniels, director-producer: "Taraji is the modern-day Bette Davis, touching audiences with her honesty and intensity." Kendrick Lamar (rapper)—written by Alicia Garza, co-founder of Black Lives Matter: "Kendrick should be applauded for inviting us to face things that are uncomfortable, for celebrating our will to survive and for being audacious enough to grapple with the questions that we all need to answer if we ever hope to get free." Jaha Dukureh (activist)—written by Peggy Orenstein, author: "In speaking out against female genital mutilation, Jaha Dukureh has refused to let horror be silenced. When she was an infant, her external sexual organs were amputated in her native Gambia. Now living in Atlanta, she founded Safe Hands for Girls to fight the practice both internationally and in the U.S., where 500,000 women have been or are at risk of being victimized. Dukureh's efforts helped make it a crime to transport American girls abroad for FGM." Barack Obama (president of the United States)—written by Jennifer Pinckney, wife of the Rev. Clementa Pinckney, the pastor and state senator who was killed in the South Carolina church massacre: "President Obama and my husband were two God-fearing, charismatic black men dedicated to public service and to their wives and two daughters. They were both voices for the voiceless who got up with smiles when they got knocked down. Of course, there were differences. President Obama loves basketball, and Clem was a terrible athlete!" Lester Holt (news anchor)—written by Scott Kelly, retired astronaut: "He doesn't take his privileged position in our country for granted, and he doesn't insert himself into the story. People liked Walter Cronkite because they trusted what he had to say, and Lester is from that same mold." Nicki Minaj (rapper)—written by Lil Wayne, rapper: "She's an icon, a boss and a role model to all these young girls out here on how to do it the right way. Her work ethic speaks volumes and has yielded these results. The scary thing is she's still going." Denis Mukwege (doctor)—written by Jill Biden, wife of Vice President Joe Biden: "What Dr. Mukwege and his team at Panzi Hospital do is extraordinary. Theirs is a reality where 48 women in the DRC [Democratic Republic of Congo] are raped every hour, according to a 2011 report. They have treated more than 46,000 victims of sexual- and gender-based violence—6-year-olds and octogenarians alike. Beyond healer to these women and girls, Dr. Mukwege is hope." Usain Bolt (track star)—written by Ziggy Marley, reggae artist and a son of Bob Marley: "He's a strong leader, and he'll continue to be an inspiration. That's the most important thing you can be." Lewis Hamilton (race car driver)—written by Mario Andretti, former race car driver: "What makes Lewis different is his attitude. He exudes confidence, but he is serene."